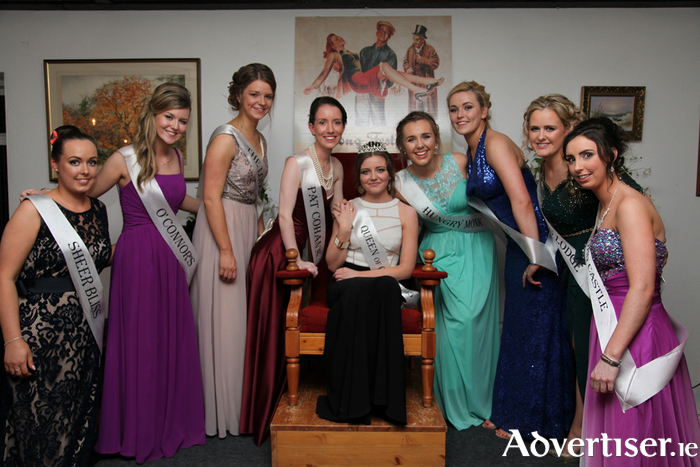 Queen of Cong Nicola O'Haire representing Puddleducks Cafe, Cong is pictured here with her fellow contestants at the Queen of Cong Selection evening at Lydons Lodge: Left to right: Clodagh Maloney (Sheer Bliss), Rachel Kelly (O'Connors), Niamh Varley (The Lodge), Aoife Munroe (Pat Cohans), Queen of Cong Nicola O'Haire representing Puddleducks Cafe, Niamh O'Mahoney (Hungrey Monk), Lelia Winters (Corrib Cruises ), Laura Flynn (Lydons Lodge) and Stacey Porter (Ashford Castle) Photo: Trish Forde. The Newman Institute in Ballina is hosting an information evening on their Foundation in Counselling Course., on Thursday, September 10 at 8pm. Castlebar RFC will host a registration night for u7 and u12 girls and boys on Wednesday, September 9 from 7pm to 8.30pm in Castlebar Rugby Club. Auditions will take place in the coming weeks for the upcoming Castlebar Pantomime production of Goldilocks and the Three Bears. Junior auditions will take place on Saturday September 12 in An Sportlann, Castlebar. Registration will commence from 11am. Ensure you bring a self addressed envelope with €3 fee. A family fee where four or more siblings are auditioning is available on request. Juniors must be aged eight years before or on the date to be eligible to audition. Adult auditions will take place on Wednesday September 16, Monday September 21, and Wednesday September 23, also in An Sportlann, from 8pm to 10pm. A public mini-vigil will be held at Knock Shrine today, September 4, with confessions from 8pm to 9pm and Vigil from 9pm until midnight in Knock Parish Church. All are welcome to attend. Sloyan's Bar, Linenhall Street, Castlebar, is looking for participants to take part in its Croagh Patrick Challenge, in aid of Aware, which helps people affected by depression and anxiety and their families. The climb takes place on Sunday September 13 and there will be entertainment afterwards for participants. If you would like to take part please phone Martina on (087 ) 0569582 for further information. A meditation programme is commencing in Ballina Family Resource Centre every Tuesday from 10.30am to 11.30am. Mayo Cancer Support Association is running this programme, numbers are limited. You can book your place with Annie or Jean on (087 ) 2804164. The Nephin Theatre Group will be touring Mayo in the coming weeks with their production of FR254, written by group director Martin Donohoe. They will be preforming the play in the Ballina Arts Centre on September 17 and 18, in Aras Inis Gluaire in Belmullet on October 2, and in the Linenhall Arts Centre in Castlebar on October 7. Mayo North East in conjunction with The Men’s Community Initiative will run a course for farming families in the coming weeks. It will be held at Áras Inis Gluire over five nights for two hours each night and is funded under the Social Inclusion and Community Activation Programme. The course will give an introduction to using a computer for your farming needs. Anyone with an interest in learning these skills is welcome to join. Call (097 ) 81079 for more details. The next meeting of the Mayo Stoma Support Group will take place on September 15 at 7pm in Rock Rose House, Castlebar. There will be a guest speaker in attendance and new members are welcome. Trialogue is an open forum for discussion on mental health issues. Users of the mental health services, carers, health care professionals, their friends, and everyone in the community are welcome. A trialogue group is a neutral space where communities can gather to develop their understanding of mental health issues, the challenges of maintaining mental health, and to transform thinking on developing better services and healthy communities. The group meets on the second Tuesday of every month at 7pm in GMIT, Castlebar. The next meeting is on Tuesday September 8 in GMIT at 7pm in room P105. On Sunday September 13 an Eastern Liturgy Mass will take place at 2.30pm in the Church of the Holy Rosary in Castlebar. The Liturgy will celebrate the Eve of the Most Holy Feast of the Elevation of the Most Holy And Life Giving Cross, during Mass there will be Novena prayers to Saint Sharabel and anointing with holy oil from the saint's tomb for all present. For more information call (087 ) 654738. Places are still available on the VTOS programme in Belmullet. If you are over 21 and on social welfare you could be eligible to join and study for a QQI Level 5 award while keeping your benefits. For more details call Theresa on (097 ) 20901 or email [email protected]. A fashion show in aid of the Roisin Tansey Trust Fund, will take place on Saturday, September 12. The fashion show will be hosted in the showroom of JJ Burke Car Sales Ballinrobe. There will be a champagne reception from 7pm, with the show starting at 8pm. Tickets costing €20 are available from local shops, JJ Burke Car Sales, or contact Eileen on (086 ) 4635581. The Lough Mask swim had to be postponed due to poor weather forecast last weekend. The organisers wish to appologise for any inconvenience caused, they have rescheduled the swim for Sunday September 13. Final plans are being put in place for a St Colman's College 1970/75 class reunion which will take place in Claremorris on Saturday September 19. A committee has been working on plans to bring together all those people who started out as first years in both A and B classes at the school in September 1970. Incidentally the reunion is being held on the corresponding weekend, because in 1970 schools reopened later than usual due to an industrial dispute. A committee member was anxious to point out that while many coming to this will have started in 1970 and finished in 1975, the reunion is equally open to those who were part of those classes for some of that period. The organising committee can be contacted as follows, Michael Clarke (086 ) 8162559, Gay McManus email: [email protected], Alec Morley (086 ) 3194453, Michael McGrath (086 ) 8534729 or email [email protected]. A common sense parenting course for parents, guardians, or grandparents who want to build on their existing parenting skills or want to learn new ways to deal with their children’s behaviour will run in the Curam Social Services Centre, Claremorris, for seven weeks, starting on Wednesday September 9 from 10am to 12 noon. The course is delivered by trained and experienced public health nurses. For more information contact Breda Connolly on (094 ) 9371196 or Breda Rogers (094 ) 9367529. This Westport Civic Trust illustrated lecture will be on Tuesday September 8 at 8pm in the Westport Coast Hotel. It will be given by Jessica Fahy, who lectures in The National Gallery of Ireland and for the Adult Education Centre of UCD. All are welcome, more details from Pip Murphy on (087 ) 2663423. Host a coffee morning/evening for your friends, family, work colleagues, etc, on National Coffee Morning for Hospice, Thursday September 17, and help your local hospice/palliative care team to continue to care for those who are ill in your community. Make the day more exciting and ask them to bring some goodies to enjoy on the day or have a raffle for the best baked item - anything goes. You will receive a free coffee pack and promotional material. Raise the spirit of your community and make this a morning of fun, chat and friendship while supporting the cause of hospice. Your support and kind generosity would be most appreciated. If you would prefer to make a donation you can do so online www.hospice.ie by emailing [email protected] or by calling (094 ) 9388666. Swinford VTOS is currently seeking applicants for the computer and business course which is due to commence in September 2015. The course, which leads to QQI/FETAC awards at levels 4 and 5, provides unemployed adults with the opportunity of returning to education, updating their skills, and improving their employment prospects. The course is free and adults who are over 21 and in receipt of social welfare for at least six months are eligible for the course. Participants aged 25 and under may be entitled to an additional €60 per week. Childcare support is also available. For further information, contact Emer at (094 ) 9251928 or email [email protected]. A structured support programme for those who have lost a partner through death, separation, or divorce is about to commence. This programme will enable you to work through your grief and pain with people who understand. An information night will take place on Monday September 7 at 7.30pm. The course will start on Monday September 14 at 7.30pm in the Family Life Centre, Boyle. For more information contact the centre on (071 ) 9663000. Caring For Carers Ireland plans to establish a carers group in Achill covering Mulranny, Currane, Ballycroy, and Newport areas. The purpose of establishing a carers group is to provide a service to family carers. Training on homecare and computer skills can be provided together with organising talks on the various issues that family carers identify. If you are interested in being part of this group contact Pat Shannon, Caring for Carers, 2 Carmody Street, Business Park, Ennis, Co Clare. Or email, [email protected] or by calling (065 ) 6866515.